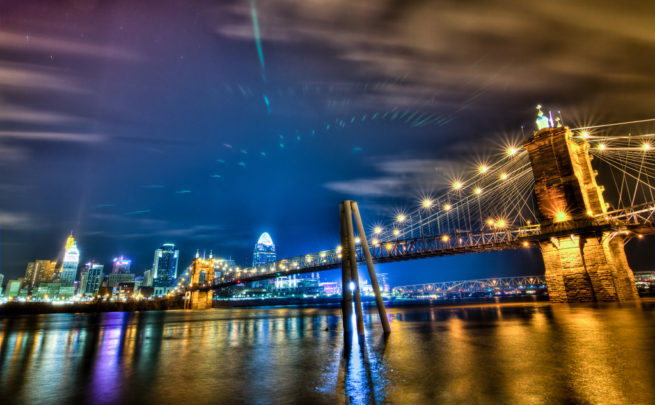 Hire a private jet and fly to Cincinnati, a popular destination for private aviation along the Ohio/Kentucky border. Cincinnati’s diverse economy and iconic cuisine make it a top destination for business professionals, while a history full of beer, festivals, and unique holidays earns it a spot ahead of Hawaii in Lonelyplanet’s 2012 list of top travel destinations. Air Charter Advisors was established to offer the highest standards in executive and leisure travel, and our team offers on-demand private jet charter service to/from Cincinnati. Our company has access to thousands of private planes from around the world certified for these flights, and we’re confident we can connect you with the right aircraft at the right cost, whether you’re flying internationally or domestically. Our company is a Wyvern-certified broker, and all of the private aircraft we use for flights to Cincinnati are operated by FAR Part 135 (or foreign equivalent) air carriers. Enjoy the comfort, convenience and peace of mind you get from working with a company you can trust, and Air Charter Advisors will become your local and global solution for luxury air travel, aircraft acquisition and private jet management. Call or request a quote for your flight to Cincinnati, Ohio. Our team can handle all aspects of private aviation, whether its booking your private jet, creating its flight itinerary, arranging in-flight catering, luxury ground transportation, helicopter lifts and any other requests you may have – consider Cincinnati Jet Charter your one-stop shop for all things private aviation in the Midwest. Hiring a private jet allows you to bypass commercial air traffic by taking advantage of airports focused primarily on private and general aviation. Clients using our Cincinnati air charter service can arrive at a variety of local airports, allowing business and leisure travelers to land closer to their destination while potentially saving on their flight cost. If you’re an executive flying private to the Cincinnati area, our private jet charter brokers can provide the perfect aircraft with our direct access to thousands of luxury private jets and aircraft based around the world. Air Charter Advisors gives clients the option to choose between a wide range of sleek, efficient business aircraft. Our team has years of experience working with private jet passengers, providing exceptional service to heads of state, celebrities, and top business executives alike. Heavy jets such as a Gulfstream G500/G550 are perfect for cross country and overseas flights, arriving at domestic destinations such as New York and Las Vegas in just a couple of hours. Rates for heavy, long-range jets can be anywhere between $6,500 – $9,000 hour, based on flight routing, scheduling, aircraft model and other variables. If you’re flying within Ohio or to a nearby by state, you can depart from general aviation airports in the region with an efficient mid-size jet like a Hawker 800/800XP/850, perfect for popular business jet hubs such as (KLUK) Lunken Airport and (KCVG) Cincinnati/Northern Kentucky Int’l. No matter which aircraft type you prefer, our private aviation team is available to to help plan your upcoming executive charter flight to Cincinnati, Ohio. A private flight to Cincinnati will land you in one of the United States’ most underrated travel destinations. Full of personality, charm, and history, Queen City has plenty to offer private jet travelers. Settled in the late 1700’s, the city retains much of its old architecture and antebellum style. 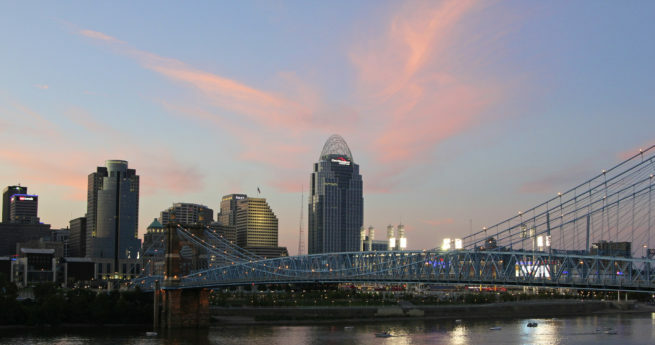 From the Over the Rhine historic district to the Brewery District and the Downtown, there are many faces to Cincinnati. Spend a day checking out the extremely walkable historic district and enjoy the many shops and restaurants that recently popped up due to the concerted gentrification effort in the area. This city doles out surprise after surprise with its cultural quirkiness and unabashed zeal for the unconventional. Unaware of its appeal, most people don’t picture Cincinnati when contemplating vacation destinations, opting for more tropical or mountainous locales instead. Well this might be a mistake, because this city along the Ohio River has personality and excitement to spare. European style villages and small food joints peddling MacGyver style cuisine are all over the place. Charming buildings and charming locals bring the experience to a climax while you take in all that the city has to offer. After a day of exploration, it’s always good to kick back with a drink in your hand and friends in your company. For this, a trip to the city’s downtown is in order. Whether you like craft cocktails, unique beers, or a PBR and a football game, this district has you covered. However, Cincinnati’s intimate history with micro-breweries begs deeper exploration into the realms of craft beer. Starting with a local favorite, Rhinegeist Brewery offers house-brewed beers and ping-pong set to a historic building. Then the ever-popular MadTree Brewing Company offers a relaxed warehouse atmosphere while you sample their craft beers and artisan foods. Combine this with the vast wilderness that surrounds the city, and you have an exceptional summer getaway for private jet travelers. Hiking, nature parks, spring flower gardens, and amazing views are in store for the visiting outdoorsman. From the iconic Cincinnati Nature Center and Withrow Nature Preserve to The Cincinnati Zoo & Botanical Garden, there’s plenty to you busy after your private flight lands. While there are a ton of options, this can mean it’s a bit difficult to choose which ones to enjoy. That’s why Cincinnati Jet Charter has compiled a list of the top attractions in the area. Based on customer feedback, online reviews, and location, this list is sure to have a few things that tickle your fancy. Spans the width of the Ohio River. A private flight to Ohio could land your right in the middle of its most charming flagship city. Full of luxury hotels and other lodgings, it’s more than capable of meeting the needs of private jet travelers from all over. Right in the heart of the city’s exciting downtown sits the luxurious Westin Hotel (http://www.westincincinnati.com/), ready to host you and your family, or any business event you may be having. From an indoor pool and well-appointed work-out room to flat screen televisions and huge studio rooms, The Westin offers plenty to keep private jet travelers as relaxed or occupied as they desire. For those that aren’t in Cincinnati for pleasure, The Westin also offers luxury event planning, catering, and hosting for a variety of business meetings and celebrations. If the sleek style of modern luxury isn’t your cup of tea, then worry not as the city has several boutique hotels and bed and breakfasts’ for relaxing getaways. Perhaps the city’s most beautiful hidden gem is the Symphony Hotel & Restaurant. Right in the middle of the historic Over the Rhine district, this mansion-turned-boutique hotel offers an elegant take on Cincinnati life. Spend a weekend listening to jazz, eating five-course meals, and sleeping in antique rooms in the heart of the city’s most interesting district. If you’re curious about even more hotels that are suited to private flyers, check out our list of the top options. Based on Cincinnati Air Charter customer feedback, online reviews, and amenities offered, this list is sure to have something for everyone. Air Charter Advisors utilizes the following airports to fly clients privately to/from Cincinnati, Ohio and neighboring areas. Fly private air charter in a Turbo Prop, Light Jet, Mid-sized Jet or Heavy Jet. Request a Quote or give us a call at 1-888-987-5387 to speak with one of our Cincinnati Private Jet Charter agents for your next luxury vacation, business trip, or special event. Our team at Air Charter Advisors believes in providing private flyers with a one-on-one consultative service experience that exceeds every expectation. We understand that your time, privacy, flight preferences and most of all, safety, are all extremely important. Our Wyvern certified jet charter representatives are available for you by phone and email 24 hours a day, 7 days a week. When using our private aviation service, you can expect quick response times and an easy, hassle-free booking process. We can arrange everything from multi-leg private flights with in-flight catering to luxury ground transportation and private helicopter lifts, our jet charter brokers consistently operate under the highest service standards.